The Housing Choice Voucher program is a valuable resource that enables over 2 million American households to reside in safe, decent, affordable rental housing. The persons residing in these households depend on Congress and the continued funding of the Housing Choice Voucher program to survive. The Housing Authority’s in Texas that administer housing assistance services depend on the Congress and HUD to provide the resources necessary to help qualified persons in our communities Texas. Information about households that receive housing assistance services is summarized below. Carmelita Guzman-Joenks was born In Chicago, Illinois, the fourth of six children. At the age of 12, her family moved to Belton to be close to an ailing relative. Her father, however, had to return to Chicago to continue working until their house was sold, and it was a year before he was reunited with the family. During some of that time they lived with their very strict, but beloved, grandmother. Eventually, the family moved into a house, with a big backyard, on Tremont where their mother still resides. Carmelita graduated from Belton High School in 1982 and earned an Associate degree in Child Development (CDA) in 1984. She is the Nursery Director at First United Methodist Church and is actively pursuing a degree in Interior Decorating while adjusting to being a single parent. We predict she will be a successful interior decorator as she has beautifully decorated her own apartment. Carmelita also assists with arts and crafts at the Belton Resident Center and is very creative with the projects offered to the seniors. While Carmelita does miss the availability of the museums and markets that Chicago had, she has become accustomed to Texas, and her family’s new roots are in Belton. Carroll Thompson was born on his family’s farm in Warren County, Indiana, the third of six children. Carroll was the baby in the family for seven years before the last three children were born. His parents were farmers all their lives and over the years had livestock such as milk and beef cattle, hogs, sheep and chickens. They grew various crops including oats and soybeans. Carroll learned to milk cows when he was five years old and did it twice daily. The children had to make their own entertainment, the favorite being riding the calves! Carroll’s parents did not have much education but instilled in their children the importance of it. Every day, the bus would pick them up at the farm for a ten mile trip to school. All six graduated from high school at a time when many never made it past the eighth grade. Following his graduation, Carroll worked for his father on the farm for two years. In 1953 toward the end of the Korean War, Carroll enlisted in the Marine Corps. He was assigned to the 4th Marine Regiment and sent to Nara, Japan. Carroll was given two weeks of Morse Code training to become a radio operator. While on leave that same year, Carroll married his high school sweetheart, Arleen. He served at Camp Lejeune in North Carolina until his discharge. By this time his parents were farming in Illinois, but Carroll and Arleen returned to their roots in Indiana. He worked at a feed and grain elevator until he broke his arm. While recuperating, he and Arleen went to Illinois to visit his ailing mother. During their trip, Carroll stopped by the Shaffer Brothers Gulf gas station and garage where his brother worked. The owners offered him a job on the spot and he accepted. So, he and Arleen packed up and moved to Danville, Illinois, where he worked for thirty years as a mechanic and partner in the business. Carroll and Arleen had six children, five boys and one girl. Unfortunately, they lost one of their sons at age 5 after a short illness. After a lifetime of frigid winters, the Thompsons moved to Hillsboro, Texas, to be near their daughter and grandchildren. 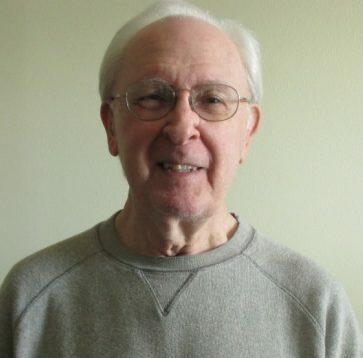 Carroll worked for the City of Hillsboro as a mechanic for another ten years. It had been important to both Carroll and his wife that they each find a hobby so they would never be bored in their later years. Arleen became an expert at creating beautiful arts and crafts, while Carroll became a master woodworker, making everything from bookshelves to coffee tables, rocking chairs and even a grandfather clock for his parents’ 50th wedding anniversary. The Thompsons also regularly attended the Disciples of Christ Church where Carroll served in many positions including elder, trustee and chairman. In 1995 while talking to others in his church regarding retiring ministers, Carroll stated that he wanted to minister to a congregation. The words were not his, says Carroll, but the spirit speaking through him. There was a small congregation in McGregor led by lay ministers. Carroll went for a Sunday visit when one of the local volunteer firemen was scheduled to speak. Right before the service began, the fireman was called to a fire and asked Carroll to fill in for him. This was the first Sunday, followed by nine years, that Carroll would lead the congregation. In 2010, Carroll’s wife of 57 years passed away. He felt that without her there was no reason to stay in Hillsboro, so he moved to Temple. Since he had always been a contributing member of society, he ran for the position of Treasurer of the Frances Graham Hall Association, an office he has held for two years. Carroll is also determined to stay in shape and walks nearly two miles every day, rain or shine. He now attends the Belton First Christian Church and occasionally officiates at various ceremonies. Carroll Thompson will never be one to watch the world go by – he will always be a participant. Gary Hunt has been a resident with the Central Texas Housing Consortium for several years. He was born in Emporia, Kansas, and attended public school in Burlington, Kansas. He had a passion for sports as a child, and although baseball was his all time favorite, he was very active in all the athletic programs his school offered. He remembers his dad as outgoing, the commander of the National Guard, and later, the State Provost Marshall of the State of Kansas. His mom was very sweet and quiet. His fondest memories are of time spent with his grandfather and trying to imitate him in every way. This included fishing, hunting, working, and even learning how to chew tobacco. After graduation, he attended Midland College in Fremont, Nebraska. After one year, he enlisted in the Air Force in Topeka, Kansas, and served for eight and one half years. During that time he married and had five children. Eventually, however, Gary and his wife separated and later divorced. He served at several duty stations throughout his military career in the United States and abroad. When he left the Air Force, he was stationed at Kelly Air Force Base in San Antonio, Texas. Afterwards, he had several jobs, but his most memorable position was with “Music City Jubilee” out of Nashville, Tennessee. He was hired as a project manager with Wally Fowler, one of the original Oakridge Boys. They traveled and set up fund raising concerts for law enforcement agencies. After some time, he moved to Eugene, Oregon, and married his high school sweetheart. He moved back to Texas In 1999, and due to health reasons, decided to stay close to the Veterans Administration Hospital, making Temple his home. Gary has 11 grandchildren and two great-grandchildren and enjoys visiting with them and following their athletic endeavors. With that continued love for sports, he has also participated in the National VA Golden Age Games for the last nine years and competed all over the United States. Perseverance, dedication, and hard work, are words that best describe Paloma Bocanegra, a participant on the Abilene Housing Authority (AHA) Housing Choice Voucher (HCV) Family Self Sufficiency (FSS) Program. Paloma has been a tenant on the HCV Program since February 2011, and a participant on the FSS Program since April 2012. Initially when approached about the FSS Program, Paloma admits to being a little reluctant and hesitant. But after gaining more knowledge about what the program was all about, and honing in on what it was that she wanted to accomplish for her and her family, the decision became easier. 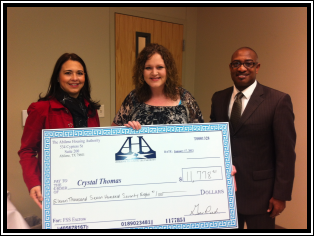 AHA is pleased to announce that Crystal Thomas has graduated from the Family Self-Sufficiency (FSS) Program! Crystal has overcome many obstacles in her life, but never gave up! She is a testament to what hard-work and persistence can do. Crystal is presently employed, attending school and just purchased a home! Ms. Pat and her dog, Blackie, have lived in the woods and on the streets of Arlington, Texas for many years. Miss Pat was sent to an asylum by her family when she was a child, when she reached the age of eighteen, she was released – to the street. Miss Pat is approximately 59 years of age although she appears to be 20 years older. She is an alcoholic who suffers from depression, and has not had contact with her family for many years. As her alcoholism worsened, 911 calls became a common occurrence. Not only did the City and its citizens incur the cost of police and detention services for Miss Pat, but also incurred costs associated with animal control for her beloved friend, Blackie. The Arlington Housing Authority, in response to a referral, assisted Miss Pat to locate a suitable privately-owned apartment for herself and her pet. Although Miss Pat was able to occupy a safe, decent, affordable furnished apartment, Miss Pat had been chronically homeless for so many years that she no longer remembered the life skills necessary to adapt to her new environment. Miss Pat would park her shopping cart, overflowing with dumpster treasures, next to her neighbor’s vehicles in the parking lot of her new apartment. A lack of housekeeping skills resulted in an infestation of bugs. Miss Pat had to be taught to bathe on a regular basis, and was in need of medical care for a gangrene infection in her foot. The intervention strategy with Miss Pat is an example of the “Housing First” model of addressing the needs of chronically homeless individuals. Only after Miss Pat’s most critical need for housing was stabilized was she able to begin to address the other areas of her life that need attention. It has been several years now since Miss Pat and Blackie have moved from the woods to an apartment. Calls to 911 are virtually non-existent because Miss Pat no longer panhandles in business parking lots. When she drinks it is in the privacy of her own home. She lives in a safe, clean environment and receives the critical care she needs. Having a safe place to call home is something every citizen needs. This case reflects current research that demonstrates that it is far more economical to address homelessness than to ignore it; and it is the humane and right thing to do. A woman, 51 years of age and homeless, recently visited the Arlington Housing Authority (Texas) before 7:00 AM. She strategically placed two suitcases that contained all her worldly possessions in the Housing Authority lobby. On the top of a suitcase she carefully placed a letter in a white envelope and exited the building. The letter, written in her hand, was a suicide note. She asked the Housing Authority to contact her two adult sons and give them a message from their mother. She conveyed a simple and final message….. “goodbye”. She wrote briefly about the struggles she experienced in life including the pain and hardship caused by her husband during their marriage and divorce. She bequeathed her simple possessions contained in two suitcases to her two adult children. Before sunrise on this bitter cold 18 degree morning she exited the building with the intention of ending her life. Arlington Housing Authority homeless assistance specialist, Trelisha Ratliff, entered the office around 7:30 am. Trelisha discovered the luggage and the note. After reading the note Trelisha immediately called 911. Dispatch transmitted an alert to all officers. A short time later housing authority staff reviewed office video surveillance images. A detailed description of the woman was forwarded to the Arlington Police Department. By noon the Arlington Police Department notified the Housing Authority that the woman was discovered in a building at the University of Texas at Arlington and was transported to JPS hospital in Fort Worth for treatment. When released, the woman will be assigned to Mental Health Mental Retardation of Tarrant County (MHMR) for outpatient care. The Housing Authority will enroll her into its Shelter Plus Care program (a rental housing assistance program for persons who have a disability and are homeless) where she will receive rental housing assistance provided by the Arlington Housing Authority and case management and other support services provided by MHMR. A human life is valuable and precious. It is comforting to know that the systems in place in our community (police, medical, housing, and mental health services) are working effectively and collaboratively. It is rewarding to know that we are all part of a team that provides help and meaningful assistance to those who are most vulnerable in our community. Upon hearing this story last night after the Commissioners meeting, I just couldn’t let it go unreported to you. The Arlington Housing Authority Board of Commissioners would like to thank you for the privilege to serve the residents of Arlington and we are proud to lead an organization that provides stable housing for people who need a helping hand which leads to reclaimed lives and brighter future. We commend the Arlington Police Department for their prompt action and care that resulted in saving the life of a person who was physically homeless and emotionally hopeless. By their actions and the grace of God this woman is alive today. We look forward to her experience of a brighter tomorrow, stably housed and on the road to recovery. In Arlington, Texas 48% of the Housing Choice Voucher (HCV) program participants are persons that are elderly or disabled, 48% of the participants are working and 4% are unemployed. One program participant, Ms. Carol, is a disabled senior. At age 73 Carol lives alone in a modest 1 bedroom condo. Carol was not always dependent on assistance programs. Years earlier Carol was married with one child. In addition to being a full time wife and mother, Carol was employed as a Registered Nurse. After years of gainful employment her husband died and her daughter moved to the west coast. One fateful day Carol was involved in a automobile accident that changed her life forever. Due to the injuries sustained Carol would never work again. Supported by a meager monthly Social Security payment and no family able to help her, Carol applied for assistance through the HUD Housing Choice Voucher (HCV) program formerly known as Section 8 housing. The HCV program enabled Carol to reside in safe, decent rental housing that she can afford. Carol pays 30% of her income for rent and the HCV program pays the balance of the rent to the property owner. Without HCV assistance Carol would not have sufficient income to reside in her current condo. Carol would not have sufficient income to live in Arlington or most anywhere else. Captioned above: Arlington Mayor Dr. Robert Cluck, Maria G., City Council Members Robert Rivera and Lana Wolff, City Manager Trey Yelverton, and Arlington Housing Authority Executive Director David Zappasodi at a ribbon cutting ceremony at Maria’s home. Maria is a mother of two teenage children who resides in Arlington, Texas. 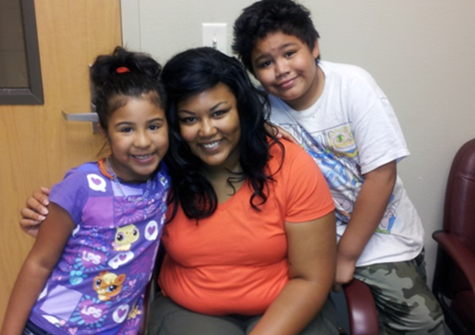 Maria and her children were homeless and living in an emergency shelter when she first met the Arlington Housing Authority. Maria received rental housing assistance from the Arlington Housing Authority’s homeless assistance program before transitioning to the Housing Choice Voucher program in 1999. Over the last 11 years, through her personal determination and hard work, Maria utilized the services provided by the Arlington Housing Authority to help her maintain her family in safe, decent affordable rental housing. During this time Maria obtained job training, stable employment, established a good credit history, and purchased her first home in 2011. Maria is a continuing participant in the AHA’s Family Self Sufficiency program working toward her final goal of returning to school. Maria utilized the Neighborhood Stabilization Program and the Section 8 homeownership program to achieve her dream of homeownership. Photos capture the ribbon cutting ceremony to celebrate her achievement. Maria transitioned from desperation and homelessness to independence and homeownership in 11 years. This success story is repeated in communities throughout Texas as a result of PHAs utilizing HUD resources in a responsible manner to help people willing to help themselves. As in this instance, HUD program resources in the hands of skilled public housing agency staff transform lives and revitalize communities. On August 15, 2013, at the Abilene Christian University (ACU) Welcome Center, the Abilene Housing Authority (AHA) held its Inaugural Family Self-Sufficiency (FSS) Graduation ceremony! The event was designed to honor six graduates of the FSS program. The FSS program is a voluntary program designed to assist Housing Choice Voucher (HCV) participants to become financially self-sufficient. AHA would like to send a special thanks to Congressman Neugebauer and State Senator Fraser’s Offices for presenting a “Congratulatory Letter” to each of the participants! We would also like to thank City of Abilene Councilman, Anthony Williams for attending, ACU, James Batiste (AHA Commissioner) and Dr. Tony Roach (AHA Commissioner, Evangelist & Motivational Speaker) for being the Keynote Speaker! The AHA wishes each of these young ladies the best in their future endeavors! We also congratulate them on their courage and determination to achieve their goals and to seek a better life for themselves and their families! 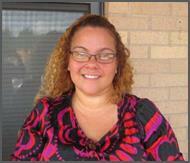 Ms. Ramsey joined the Tarrant County Housing Assistance Office (TCHAO) Family Self-Sufficiency (FSS) program in 2009. At that time she was not employed, had not finished high school and did not have transportation. Despite these and other obstacles she faced, e.g., being a single mom with 2 minor children, she was determined to accomplish her goal of making a better life for her family. It was difficult for her to find gainful employment to support her family because she could not afford costly day care services and did not live close to public transportation. TCHAO FSS staff gave her the support, encouragement, referrals to social and other services she needed to help her overcome these barriers. Her first goal was to earn a high school diploma, so she enrolled in an on line accredited program with the American School and obtained her high school diploma within one year. This accomplishment helped her to be successful in obtaining part-time jobs at various banks. Her next goal was to eliminate outstanding debts which she did in 2010. When both of her children became school age, she began applying for full time positions and is currently employed at a mortgage company earning over $34,000 per year. She will begin paying full rent in March, 2013, and expects to be self-sufficient at that time. Jerry Chrisner’s father was in construction, so the family moved a lot, following the jobs around Texas. Since these constant moves affected Jerry’s education, he was labeled a slow learner and assigned to Special Education classes. At age 14, he went to live with his uncle in Mississippi and was placed in the State School where he was trained in woodworking, childcare and elder care. After his first job as a live-in provider, Jerry enlisted in the Army and served as a cook for several years. When he left the service, Jerry lived at the Temple V.A. Domiciliary because of poor health and weight. Despite these issues, Jerry worked two jobs. Since he had always loved the movies and theater, he also began auditioning for the Temple Civic Theatre and appeared in numerous productions. When Jerry moved back to Bell County in 2010, he became a Temple Housing Authority resident. Jerry’s health was extremely poor at this point as a result of obesity; however, he had many friends and decided that with their support and his willpower, things were going to change. Jerry enrolled in CTHC’s GED classes, determined to prove to himself and others that he could succeed. In 2012, Jerry earned his GED. He enrolled at Temple College and will earn his Associate’s Degree in Computer Data Entry next year with the assistance of the CTHC scholarship program. Jerry proved to himself and others that he has a great deal to offer and the willpower to see it through. He serves as a shining example of what is possible if you believe in yourself. Shawn Womack (FSS Participant): FSS Family Moving Towards Self-Sufficiency! The Abilene Housing Authority (AHA) is proud to announce that Shawn Womack (pictured above), a Family Self-Sufficiency (FSS) participant, was selected to receive an annual scholarship provided by Professional Women in Building of Abilene (PWB)! This is the second consecutive year that one of AHA’s FSS participants has received one of the scholarships provided by PWB to be applied toward a students four year university, 2 year junior college, or trade/technical school cost. 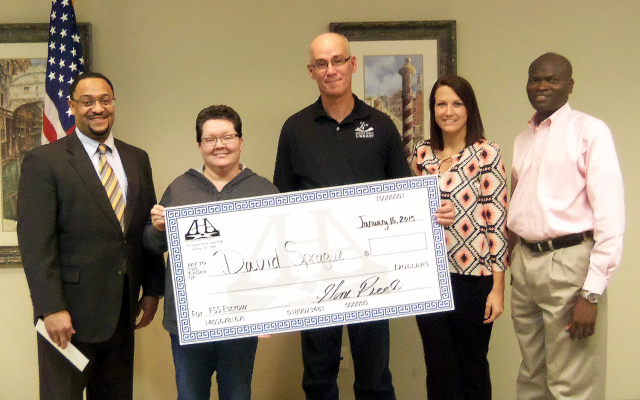 AHA congratulates Shawn on recognizing the importance of continuing her education and for receiving a scholarship to financially assist her in obtaining her advanced education! The National Association of Home Builders (NAHB) Professional Women in Building Council represents thousands of members throughout the United States and serves as the voice of women in the building industry. The NAHB PWB Council represents members working in all facets of the industry as builders, developers, remodelers, trade contractors, architects, marketers, designers and mortgage brokers. We got on the program in 2012, and 6 months later we were approved for FSS program. I, DeAnna, was hopeful for the future that this would allow my family to become sufficient and live a stress-free life together. I was able to show my daughter you don’t have live month to month and can budget with a good outcome. I always reminded myself how much easier it is to be self-sufficient and lie independently with a the assistance. I can honestly say living on welfare takes more work than it is to be self-sufficient. Today, I can say with pride and joy that my husband, David has bet his goal of maintaining employment that included insurance and benefits. Since then, he has received 4 raises within two years. I , myself, continue to set goals to achieve success. I am enrolled in CNA class this month where I plan to continue growing. I hope this inspires someone who thinks it is not possible. Quitting is easy, but pressing through is more rewarding! I want to than FSS program, Abilene Housing Authority and the Lord for giving us the strength to push through and not quit. When Janice moved to Belton, she had no idea she would be speaking before our state capitol’s legislative body and interviewed by the television and newspaper media. Janice was born and raised in Ponce, Puerto Rico, and is the 13th of 14 children. She says the family wasn’t wealthy, but they weren’t poor either. Her parents’ employment was often seasonal. When her father wasn’t share-cropping, he worked as a carpenter and in masonry. Her mother was a seamstress, making school uniforms and formals for weddings or other special celebrations. As Janice’s siblings moved away, she enjoyed spending time with her younger sister playing outside. She quickly learned to “toughen up” as she calls it, in a male dominated neighborhood. She often had to take up for her “baby sister,” who did not know how to handle rough-playing boys that liked to push the limits. Janice quickly went from learning to teaching them not to mess with the Riveras. She said they weren’t bad boys, they were just too rough. When she was old enough, she spent summers at her older sister and brother-in-law’s home in Queens, New York. She enjoyed it so much, she moved in with them when she was 16 years old and remained with them until she graduated from high school. Sometimes she went to work with her sister at a clothing factory during the week and to Coney Island’s amusement parks and Far Rockaway beach on the weekends. Some of her weekends were also spent with her brother, Hector (9th of 14), in Pennsylvania. In 2012, Janice, her husband and five children moved to Killeen to be closer to her brother, who had moved here from Pennsylvania, and a job offer for her husband. The job was no longer available, and the bills had to be paid. This brings us back to the beginning of our story. Janice’s family was experiencing financial difficulties, so like many others, she took out a loan from a car title/pay-day loan company. The high service fees made it impossible to pay off the loan, so the family’s vehicle was repossessed. She sold some of her household items in order to pay the repossession fees. Since she was a client of Helping Hands Ministry, her story was heard by Executive Director Rucker Preston, who asked Janice to share it at the state capitol during two Texas House Committee hearings. After her second testimony, she was approached by several television and newspaper reporters for a press conference, so she told her story once again, hoping others wouldn’t go through what her family endured. Janice has now transitioned from a Helping Hands client to an advocate. Sherwin Eugene Hufford (Gene) was born in Wichita Falls, Texas; an only child. He grew up in a great neighborhood that had one other person who was an only child so they decided to be “siblings” and childhood best friends. His dad owned a wholesale produce company, and his mother was a stay-at-home mom. Gene attended public school in Wichita Falls, and after graduation attended the University of Texas in Austin. As a first semester freshman, he was interested in obtaining a Bachelor in Business Administration. Shortly after his first semester, however, a graduate student convinced him to take a course in Geology. He became fascinated with the study of the earth’s physical structure and substance along with its history and processes, so he changed his major to Geology. After college, Gene wanted to work for an oil company but realized that in order to advance, he needed a Masters Degree. Not being able to find work since the oil business was in decline at that time, he enrolled at Baylor University in Waco to earn a Masters in Geology. This program was only three years old when he began, and he was talked into teaching a lab in Meteorology, which surprised him! Gene continued looking for work, and after a year at Baylor, he landed a job with an oil company back in Wichita Falls. After nine years, he split from the company with his supervisor and formed a successful, new business. Due to illness, Gene had to end his career as a Geologist and decided to move back to Austin because of the amenities available and medical accessibility. He began to enjoy outdoor hobbies and walking to improve his health. Austin’s economy eventually caused him to begin looking for another place to live. He had visited Temple once and was impressed by the size of the town and what it had to offer. He also liked the historical aspect of the city so decided to move. Gene enjoys working with electronics and web browsing. He appreciates the history of Temple and is learning of all the good things the city has.